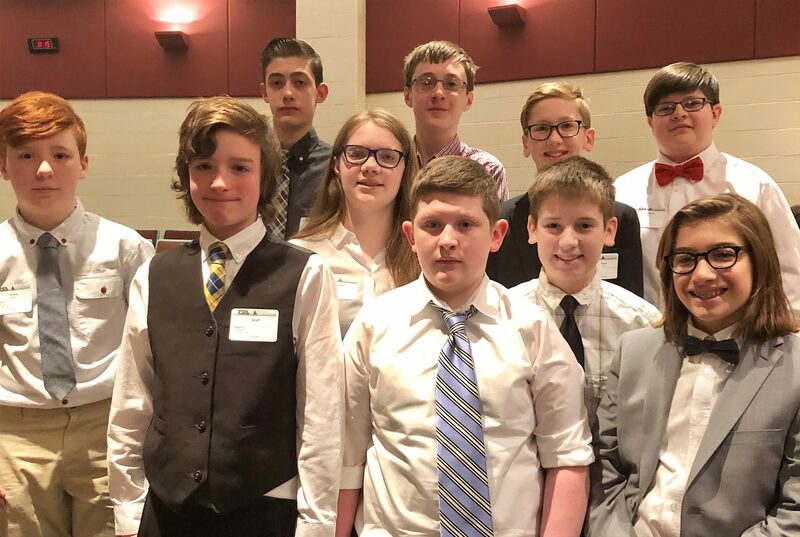 Twenty-eight Penn Manor students have qualified to compete on the state level after their strong showing at the Technology Student Association regional conference Feb. 9 at Huesken Middle School. Ten students from Manor and Marticville middle schools and 20 Penn Manor High School students competed against their peers from Lancaster, Berks and Lebanon counties in more than 40 events, ranging from structural design and engineering to extemporaneous presentation. Penn Manor middle school teams placed first in Biotechnology, Medical Technology, Safety Illustration, and Off the Grid events. The high school teams took top honors in Biotechnology, Extemporaneous and Prepared Presentations, Video Game Design, Webmaster, Safety Illustration, Children’s Stories and Problem Solving events. Here are the students who qualified to compete at the state conference April 10-13 at Seven Springs Mountain Resort in Champion. Biotechnology: Mitchell Jackson, Kieran McFall and Anders Murphy, 1st place. Medical Technology: Suren Clark, Ian Groff, Mitchell Jackson and Anders Murphy, 1st place. Off the Grid: Mitchell Jackson, Caden Jacyszyn and Aders Murphy, 1st place. Safety Illustration: Benjamin Hickey, 1st place; Ava Ritchie, 3rd. Tech Bowl – Written: Suren Clark, 2nd place. Mass Production: Suren Clark, Ian Groff, Benjamin Hickey, Caden Jacyszyn and Noah Reen, 2nd place. Problem-Solving: Kieran McFall and Ava Ritchie, 3rd place. Challenging Technology Issues: Suren Clark and Benjamin Hickey, 3rd place. Biotechnology Design: Audrey Jachimowicz and Jordan Schucker, 1st place. Children’s Stories: Sophie Groff and Jaden Smith, 1st place; Morgan Cooper, Bernie Eckman and Audrey Ritchie, 3rd place. Extemporaneous Presentation: Ray Gerner, 1st place. Prepared Presentation: Isaac Leshok, 1st place; Audrey Ritchie, 3rd. Technology Problem Solving: Ray Gerner and Cole Shenk, 1st place. Video Game Design: Aidan Lewis, Audrey Ritchie and Aliya Trussell, 1st place. Webmaster: Audrey Ritchie and Aliya Trussell, 1st place. PA-Safety Illustration: Grace Fafel, 1st place; Ray Gerner, 2nd. Forensic Science: Audrey Jachimowicz and Jordan Schucker, 2nd place; Kaylee Jackson and Cole Wilson, 4th. Software Development: Aidan Lewis and Aliya Trussell, 2nd place. Board Game Design: Morgan Cooper, Bernie Eckman, Kaylee Jackson and Isabella Price-Dubble, 3rd place. Debating Technological Issues: Sophie Groff and Bernie Eckman, 3rd place. Computer-Aided Design—Engineering: Ryan Buchwalder, 4th place. Photographic Technology: Jordan Schucker, 5th place. Congratulations to these students for representing Penn Manor so well, and best of luck in the state competition!